The brainstorming took far shorter than I had expected. The composition was kept simple with a digestives base, as how many American no-bake cheesecakes are crafted from. I was deliberating between pate sucree, sable breton, dacquoise for the base but decided to stick to “cheesecake traditions” instead. Then there are two layers of creamcheese mousse, made lighter with the incorporation of whipped cream and stabilised by a hint of gelatine to battle our treacherous weather. When I was thinking through the components of the cream cheese mousse layer, Sugino’s mousse entremet floated in my mind but of course, remained as a fleeting thought as such delicate mousses are much of a challenge in our weather. I wished for a more prominently tangy cheesecake, and made it passionfruit flavoured. It is one of my favorite fruits to work with, with a melange of both sweet and astringent flavours, not to mention being highly highly perfumed. It also pairs very well with chocolate on its own, as evident in Pierre Herme’s Mogador series. In between the layers of cream cheese mousse, there will be a layer of biscuit joconde to cushion the weight of the layers above, and also to absorb the moisture from the cream cheese and gelee layers. Above that is a layer of mango and passionfruit gelee. 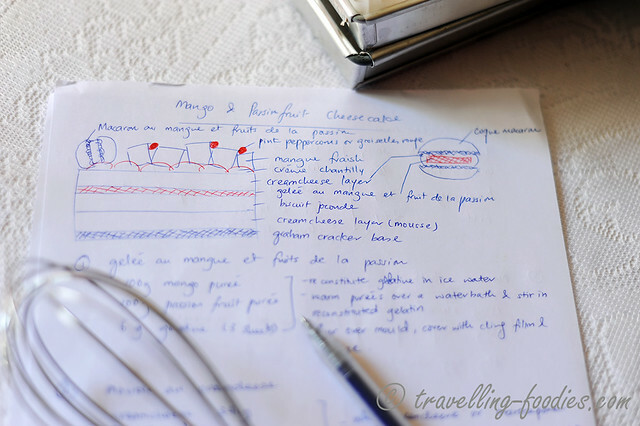 This, together with the biscuit joconde are basically 101 of french pastry making. 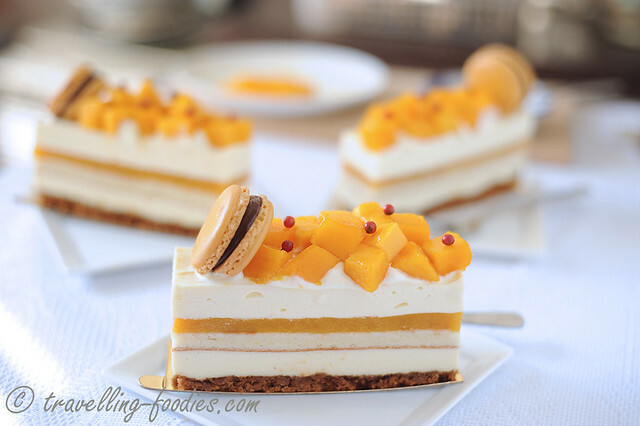 Then comes the topping, which I’d decidedly kept simple, with just cubes of fresh mangoes placed over dollops of creme chantilly which lends a slightly sweetish tone, as well as a chocolate macaron with a passionfruit and mango ganache filling. Being a multi-layered entremet, it still requires a fair bit of time and space to build. The workflow is planned out to allow me to work out the components over two days. The first to be made was the mango and passion fruit gelee which was subsequenly left to set overnight. Then I made macarons shells. The hot weather helped quite a bit in the drying of the shells and before long, out the shells came out of the oven with pretty feet! 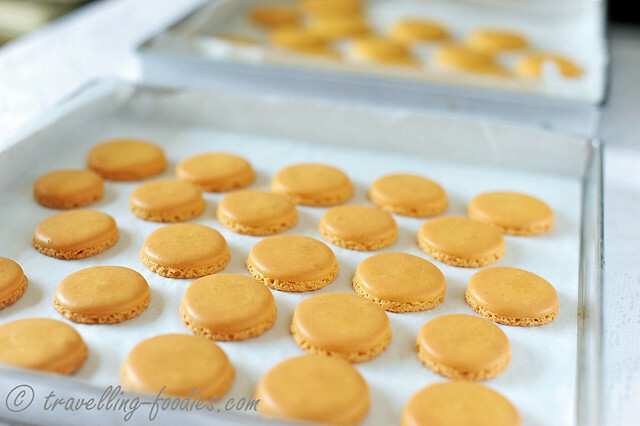 A timely revision for making macarons as well. 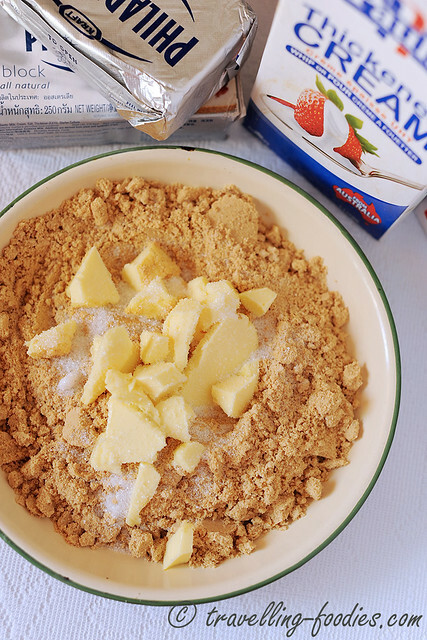 Then it was the base of digestives aka graham crackers which was first pulverised into a sandy texture before being mixed with butter and sugar to forge the cookie dough which is rebaked for everything to come together. 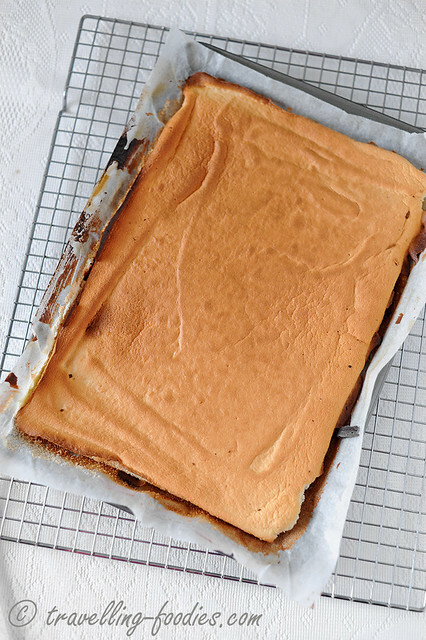 A layer of joconde sponge was baked, using Sugino’s recipe of course, barely minutes in the oven for the sponge to remain soft and moist. It was wrapped with cling film and kept overnight for flavours of the almond to develop. After the cream cheese mousse is prepared, all the components are ready to be assembled, first starting with the base and then slowly building up layer by layer, of passion fruit cream cheese mousse, biscuit joconde, mango and passion fruit gelee, and finally another layer of cream cheese mousse. This is then left in the fridge to set. But the work is not quite completed. 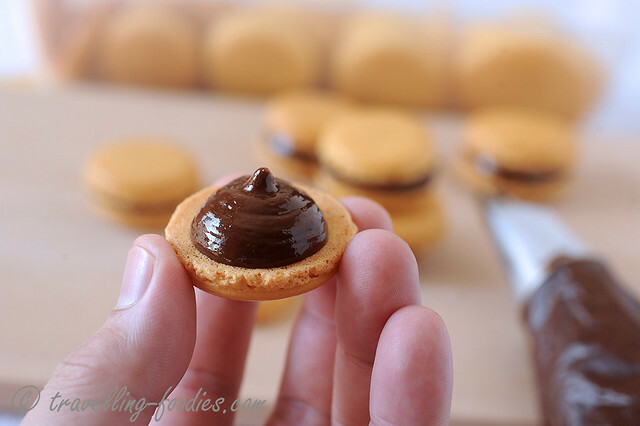 During the setting, the mango and passionfruit ganache is made as the filling for the macarons. I’d initiated wanted to do a cream cheese filling with passion fruit gelee embedded inside, like Macaron Satine which I’d made four years back, but decided against it in the end for fear of having too much cream cheese would be too cloying. After scrapping the creamcheese filling idea, I’d finally opted for a dark chocolate ganache filling, modified it from the recipe for Pierre Herme’s Macaron Mogador by doing partial replacement of passionfruit puree with mango pulp. After the entremet has nicely set in the fridge, it is cut to size of how they would be served individually. Upon layering on the cake boards, the building of this entremet is now into its final stages, garnishing with creme chantilly, fresh mango cubes, macarons and not forgetting the pink peppercorns. I’d included them in this entremet cos they are not only aesthetically pleasing but also lends a slight spicy flavour if one has mustered sufficient capricious bravery to bite into them that is, while enjoying the cake. But rest assure that they are not hot like their Sarawakian black or white cousins, and no where near as mumbing as their Szechuan counterparts. Beautiful in both their rouge appeal and flavours imbued. Reconstitute the gelatine in icy water until nicely soften. Warm the fruit purees over a bain marie until 70 degrees Celsius. 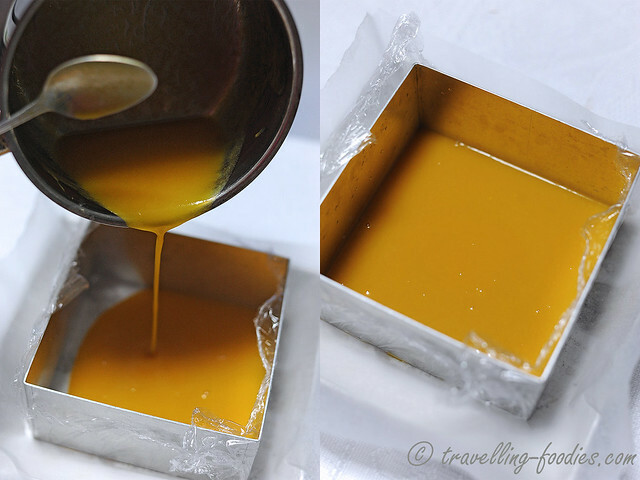 Squeeze as much water out of the reconstituted gelatin sheets and stir into the heated puree to melt. Bake in a preheated oven at 180 degrees Celsius for 12 min. Leave to cool completely and wrap with cling film. Follow recipes for french meringue or italian meringue respectively as preferred, with a few drops of egg yolk yellow food colouring for the shells. As I was only making a small batch of about 20 macarons, I’d used the french meringue technique which works very well for me. But I have friends who prefer the italian meringue method so it is very much up to the individual. Sift ground almond and icing sugar well several times to form a tant pour tant. Add in egg yolks and 30g egg whites and whisk until pale. Set aside. Make french meringue with 100g egg whites and 60g castor sugar. Temper the almond-yolk mixture with a small portion of the meringue. Fold in the rest of the meringue into the mixture and finally fold in the cake flour. Spread batter over baking sheet lined with greaseproof paper with an offset spatula. Bake in a preheated oven at 230 degrees Celsius for 6 min. Peel quickly to release steam and set aside to cool to room temperature. Wrap with clingfilm and set aside. Melt gelatine powder in tepid water and leave in fridge to cool down slightly. Whisk double cream with half of the castor sugar to form a creme chantilly. Place mixing bowl in the fridge to firm. Whisk cream cheese under low speed until it softens and smoothens out slight before adding milk, remaining half of sugar and passionfruit gelee to incorporate. Finally whisk in the gelatine mixture until smooth. Fold in creme chantilly into the cream cheese mixture and leave the mixture in the fridge until ready to build the entremet. remove cling film over digestive base and mousse ring. Pipe half of the cream cheese mousse over the digestive base. Leave in fridge to set overnight. Heat the purees until 70 degrees Celsius and pour over chopped chocolate in a mixing bowl. Mix the components until chocolate has melted completely. Place the mixing bowl over a bain marie if necessary. Add butter and mix well to incorporate. Wrap cling film over mixing bowl and leave in fridge for ganache to firm up slightly. Whisk the cold cream in a cold mixing bowl with the icing sugar until firm and lush. Do not overbeat. Leave in fridge to firm up slightly. To assemble, cut the entremet while it is still cold into 5 portion. Pipe dollops of creme chantilly over the top of each portion. 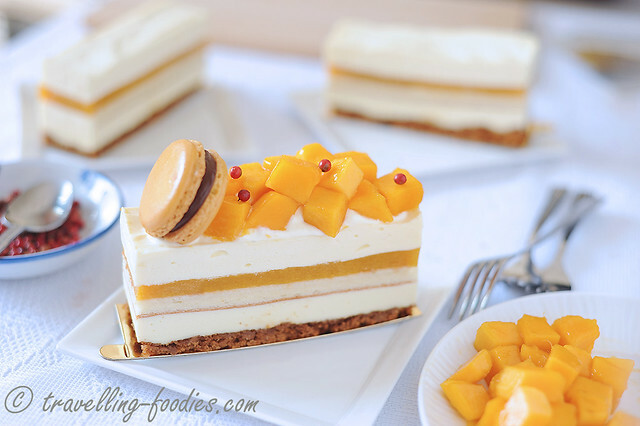 Arrange mango cubes over the whipped cream and place a macaron on one end. Add a few pink peppercorns over the time. Leave in fridge to chill until ready to serve. As fresh mangoes are used, finish within a few hours. 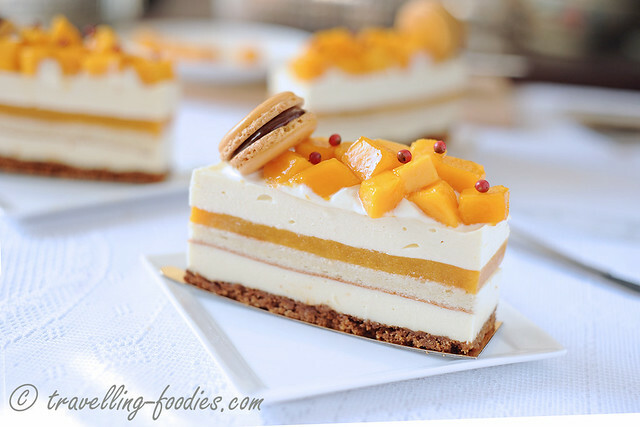 If the entremet has to be assembled ahead of time, brush the mangoes with a layer of passionfruit juice followed by a thin layer of apricot glaze to impede oxidation. 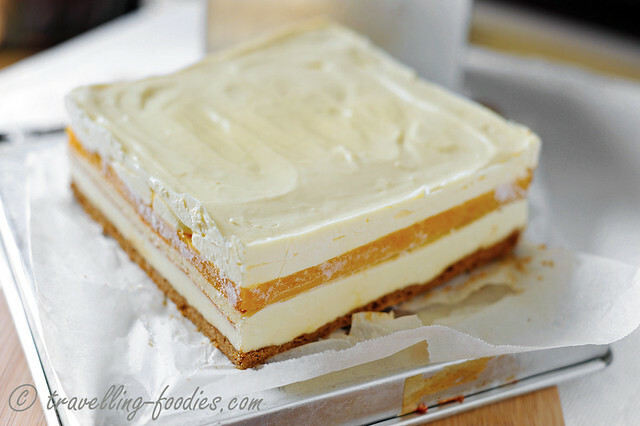 I am submitting this for the Bake-Along #78 : Bake-Along 4th Anniversary Theme – Cheesecake, hosted by Lena of Frozen Wings. Congratulations on your 4th anniversary for the event, Lena! This entry was posted on May 7, 2015 by Alan (travellingfoodies). It was filed under Food, Simple Eats and was tagged with biscuit joconde, cheesecake, creamcheese, digestives, entremet, ganache, gelee, graham crackers, macaron, mango, passion fruit, phildelphia creamcheese, pink peppercorn. Such a beautiful dessert with so many components to it. Bet it taste good too. Thanks for sharing. halo halo…this is genius..! I dont think i can manage anything like this..this is so neat and pretty..if you need help next time call me..i can help you by sprinkling the red peppercorns..hehe..thx alan for linking this post with bake along! thanks Lena! congrats on your 4th anniversary of your bakealong once again! This cheesecake looks stunning! It is like an exquisite work of art. Such a beautiful and delicious creation!